*I received a complimentary e-copy of this book from BookLook Bloggers book review program and Thomas Nelson (a registered trademark of HarperCollins Christian Publishing, Inc.) in exchange for an honest review. All thoughts below are my own. Also, this blog post includes affiliate links which means I will receive a commission based on sales generated via these links. This fast paced, dramatic story takes readers on an exciting journey to Lavender Tides, Washington. Oddly enough, this was my first Colleen Coble novel. Being a prominent suspense novelist in the Christian fiction world and a USA Today Bestselling Author, I’m surprised I haven’t read Coble’s books before. Regardless, I’m glad I chose this book and even more delighted it did not disappoint. Rather, it enticed me to read more books from this clever, creative author. Secrets of Cedar Cabin was a book that immediately drew me in and kept me turning the pages as fast as I could. This novel was well planned, well paced and had enough suspense to keep me hooked! ★★★★★ || I enjoyed several aspects of Secrets of Cedar Cabin . The first being the pace of the book. It moved quickly and kept me so interested, I finished it in just a day and a half. Being a suspense fiction lover, I really enjoyed the story line and the plot as it thickened and wove. Being an animal lover, I enjoyed Bailey’s cat and the delight Sheba brought to the story. (I’ve since learned that Coble often includes a pet in each of her stories and that made me love her all the more!). This novel was a great read, the suspense was intriguing and the plot was dark and sinister, but not in a bad way. The story had romance, a touch of faith and drama. None of it was overbearing or overdone. It was all just right! Coble’s characters were endearing and easy to relate to. Following along with them as they grow in their faith and relationships was encouraging. One thing I will say is that there seemed to be a lot of characters introduced which left me a little disoriented. As a result, I had the sense the book was a part of a series, which I didn’t know at first. Because of my personality and the fact that I enjoy books more when read in order, I wanted to include this fact. I recommend reading the other books in this series first, but it’s not imperative. Coble does a decent job of making her books stand alone novels, but I believe the stories have more impact if read in order. Since finishing the Secrets of Cedar Cabin , I’ve actually read the entire Aloha Reef collection which I also highly recommend. Coble is a master at her novels and I’ve enjoyed each and every one I’ve read so far! Colleen Coble | Best-selling romantic suspense author Colleen Coble’s novels have won or finaled in awards ranging from the Best Books of Indiana, the ACFW Carol Award, the Romance Writers of America RITA, the Holt Medallion, the Daphne du Maurier, National Readers’ Choice, and the Booksellers Best. She has nearly 4 million books in print and writes romantic mysteries because she loves to see justice prevail. Colleen is CEO of American Christian Fiction Writers. She lives with her husband Dave in Indiana. Visit her website at www.colleencoble.com. You can also follow Colleen on Facebook, Twitter or Pinterest. Lastly, pick up your own copy of Secrets of Cedar Cabin or borrow it from your local library. Then, I'd love to hear YOUR thoughts on the book in the comments below! *I received a complimentary copy of this book free of charge from BookLook Bloggers book review program for Tommy Nelson (an imprint of Thomas Nelson) in exchange for an honest review. I was not required to write a positive review. All thoughts below are my own. Also, this blog post includes affiliate links to purchase the book and I will receive a commission based on sales generated. The PERFECT Easter basket addition! With sensory pages sure to delight your little one, this adorable prayer book offers thanksgiving to God for all the wonders of spring! The perfect addition to your little one’s Easter basket this spring! | A Book Review of An Easter Prayer, Written by Amy Parker, Illustrated by Alison Edgson. A Children's Touch-and-Feel Picture Book! ★★★★★ | This sweet Easter prayer book simply couldn’t be more adorable or precious! It’s perfect for explorative infants and toddlers who enjoy the different sensations a touch and feel book has to offer. With a fuzzy cover and unique textures inside, this prayer book is my favorite addition to my daughter’s Easter basket as we look forward to celebrating her first Easter this year. An Easter Prayer shares short prose with a new setting and colors on each page. The adorable illustrations with delightful colors will melt your heart as Bunny and her new friend, Chick, offer little bits of thankfulness to God for the wonders of spring. I adore that the book encourages an attitude of gratitude for various springtime delights and highlights that being most thankful for Jesus. Reading this book with my ten month old daughter is an excellent way to impress the true meaning of Easter on her heart at a young age. I feel certain this will be an Easter/Spring favorite for years to come. The quality and thickness of the board book pages are impressive and I highly recommend this book as a gift for new parents/babies, an Easter basket addition for toddlers or a baby shower gift for babies due this spring! Lastly, pick up your own copy of An Easter Prayer or borrow it from your local library. A romantic tale of espionage, war, loyalty and the bond of family. 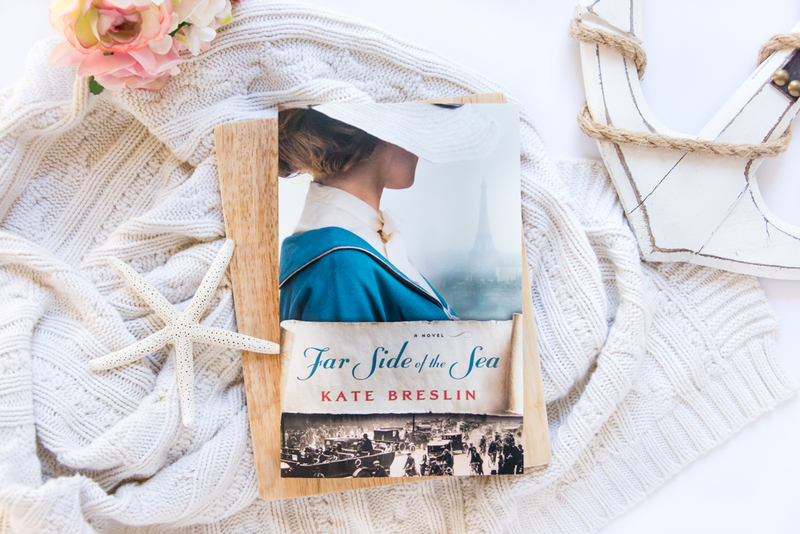 This beautiful new novel from one of my favorite authors offers the lovely story of a young woman desperate to find her family, a young man determined to honor his promise and a captivating romance set in Europe during the era of World War I. ★★★★ | In true Kate Breslin fashion, she delivers another exquisitely romantic tale in Far Side of the Sea. This sweet, tender historical fiction novel is all I hoped for and more. Being a huge fan of Breslin’s novels, For Such a Time and Not By Sight, I was looking forward to this newest release. Johanna Reyer is a young woman, alone in this world, desperately seeking to find her sister and father in war-torn France. Her journey and persistence lead her to Colin Mabry, one of her sister’s friends who works decoding message for MI8. As the pair sets out to locate Jewel Reyer, they work together posing as a married couple and traverse Europe during the era of WWI, working alongside undercover British, French and American secret service agents. I was captivated with this story from the first few chapters. Both Johanna and Colin battle their own unique past scars and uncover God’s truths along the way. The level of mystery that ensues the characters as the story unfolds is tantalizing. While the ending didn’t quite surprise me (I had my suspicions all along), I found the story was still complex enough to hold my interest and keep me entertained. The blooming romance between the two main characters was so touching plus I enjoyed their banter early on. In Far Side of the Sea, Breslin educates readers to the unique way in which the various militaries utilized carrier pigeons during WWI, by weaving it into her narrative. I found this fascinating and learned something I hadn’t known before. I believe historical fiction lovers will enjoy this aspect of the novel, along with the WWI setting. Because the story holds a sense of mystery with espionage and the search for Jewel, light suspense readers may enjoy this story as well. As always, Breslin does an excellent job of delivering a beautiful Gospel message through her characters’ experiences and that is something I love dearly about her novels. So in conclusion, while For Such a Time is still my favorite Breslin novel, Far Side of the Sea is a great read also and one to be recommended! A Florida girl who migrated to the Pacific Northwest, Kate Breslin was a bookseller for many years. She is a Carol Award winner and a RITA and Christy Award finalist and lives with her husband in Seattle, Washington. Find her online at www.katebreslin.com. You can also follow her on Facebook, Twitter, or Pinterest! Lastly, pick up your own copy of Far Side of the Sea or borrow it from your local library. Then, I'd love to hear YOUR thoughts on the book in the comments below! *I received a complimentary copy of this book from Shiloh Run Press, an imprint of Barbour Publishing, Inc. and was under no obligation to post a review. All thoughts below are my own. Also, this blog post includes affiliate links which means I will receive a commission based on sales generated via these links. ★★★★★ | Hands down, this brand new thriller from Ginny L. Yttrup is a book I will recommend over and over. While this author is new to me, the suspense fiction genre isn’t. I was excited to read Convergence after glancing over the synopsis and happy to report it did not disappoint, but rather, far exceeded any expectations I had. Readers will follow along, turning page after page as quickly as possible, while Yttrup weaves an intriguing, captivating story of suspense that keeps her readers engaged to the very end. Psychologist, Dr. Denilyn Rossi, is a brilliant character and I thoroughly enjoyed a look into her mind and heart as she struggles to battle a past that still haunts her and the fear that has presently immobilized. Being cautious not to give too much of this novel away, I will say that I thought Convergence was very well written with an action packed plot. The characters were relatable, strong and solid. As Denilyn flashes between the story of her assault seven years ago and her current fearful situation, the story becomes riveting and truly had me on the edge of my seat. I believe the fear of the unknown is one of the strongest types of fear a human can encounter and Yttrup does a fantastic job of using that to her advantage. Adelia’s strong, faith driven character is beautiful in it’s own right and a great fit to this story. Around every turn, the knowledge of a psychopathic stalker who’s making deadly threats, drives these two women in their every step creating an exciting story of suspense and mystery for readers. The ending left me surprised, satisfied, and made me want to read the book again! I loved the fact that Yttrup didn’t shy away from personal struggles including fear, control, and divorce but instead embraced them and used them to point to a deeper, more meaningful relationship with God. The faith based element of Convergence is perhaps my favorite part. It wasn’t over indulgent or forceful but rather encouraging and enriching. Because this novel is written in the first person, Yttrup uses her characters’ thoughts and feelings to expose readers to a wide range of thoughts and feelings… ones we’ve all had at one time or another. As the novel moves forward and the characters’ relinquish their fears and control to God, we see the beauty and redemption in surrendering ourselves to Him as He guides our steps. I recommend Convergence to mature readers who enjoy Christian contemporary fiction, psychological thrillers, suspense and mysteries. Happy Reading! Ginny L. Yttrup is an award-winning author who writes contemporary, issue-driven fiction meant to engage the reader and encourage them to a deeper relationship with God. Ginny is a sought after retreat, even and writer’s conference speaker. Visit Ginny online at http://ginnyyttrup.com. You can also follow her on Facebook, Twitter, or Instagram. Lastly, pick up your own copy of Convergence or borrow it from your local library. Then, I'd love to hear YOUR thoughts on the book in the comments below! *I received a complimentary copy of this book from Barbour Publishing and was under no obligation to post a review. All thoughts below are my own. Also, this blog post includes affiliate links which means I will receive a commission based on sales generated via these links. 1893 | Chicago’s World Fair, mysterious disappearances, romance, undercover adventures and the secrets of the infamous H.H. Holmes, rumored to be America’s first serial killer. Will she be able to expose H. H. Holmes’s illicit activity, or will Winnifred become his next victim?. ★★★ | Perhaps, you know of the infamous H.H. Holmes, a man rumored to be America’s first serial killer. And perhaps you do not. 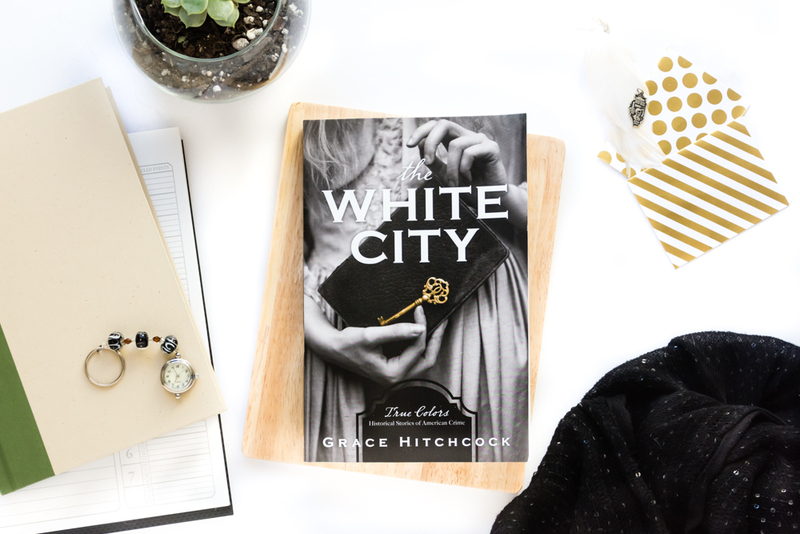 This newly released novel, The White City, by Grace Hitchcock delves into that fantastical story of a man who’s true story is still somewhat unknown. Readers will join fictional character Winnifred Wylde as she seeks to uncover the truth about H.H. Holmes. As the daughter of Chicago’s inspector Wylde, Winnifred spends her days buried in romance novels until she finds herself captured up into the real life crimes of H.H. Holmes. Posing as his secretary, she works undercover for this dangerous man, under the protective eye of the dashing Jude Thorpe, a true life detective and one of New York’s finest. The budding romance between these two characters is the highlight of this novel! I gave this book three stars and want to encourage others to read and discover the story for themselves because I’m certain there will be many readers who will enjoy it immensely! When I first read about this series and the release of this book, I was excited and anticipating a truly suspenseful plot, rich with historical facts and fictional liberties . After all, we’re talking about a serial killer and a time in history when crime was rampant. I expected a serious tone to The White City but instead found more of a Christian romance than a true crime novel. What I loved about this novel was the setting, the villain, and Miss Wylde and Detective Thorpe’s romance. Detective Thorpe, with his handsome and protective demeanor is the epitome of a romance novel’s hero. I also loved the backstory of H. H. Holmes and his underhanded swindling, insurance fraud and the mysterious killings that he committed in his “hotel” with hidden doors and rooms. Truly, if the author had focused on these three things solely, setting aside Miss Wylde’s personal life, aunt and suitors, this would have a top notch read and exactly what I was hoping for from The White City. More historical background on Chicago and the World’s Fair would have been icing on the cake. At times, I felt like I was expected to have prior knowledge of these things as a reader and unfortunately, I had only but a little. For instance, I never did discover why Chicago was called the White City and found myself Googling H. H. Holmes too. In the first two thirds of the book, I struggled with the characters and their actions/decisions, the plot and the parts about Miss Wylde’s aunt and suitors which I found myself hurrying through. I desperately wanted more suspense and a deeper plot focused more on Holmes and his crimes. The climax of this novel near the end was my favorite part for this reason - suspense, crime, romance and heroism all rolled up into a few chapters! In the end, this was a solid three stars for me. A good book with a hint of crime, lots of romance and a tiny dash of suspense. I encourage you to read this book for yourself. I think readers will find the characters to be likable, the story flows along fluidly and the author writes very well, even if it wasn’t the way I initially expected or wanted. This novel is a light read, a clean story for young adults and there’s a delightful romantic aspect to the book that romance readers will enjoy with just enough historical fiction to entice a historical fiction lover. and The Gray Chamber from Barbour Publishing. She has written multiple novellas in The Second Chance Brides, The Southern Belle Brides, and the Thimbles and Threads collections with Barbour Publishing. She holds a Masters in Creative Writing and a Bachelor of Arts in English with a minor in History. Grace lives in southern Louisiana with her husband, Dakota, and son. Visit Grace online at GraceHitchcock.com. You can also follow her on Facebook, Twitter, Instagram or Pinterest! Lastly, pick up your own copy of The White City or borrow it from your local library. Then, I'd love to hear YOUR thoughts on the book in the comments below! *I received a complimentary copy of this book free of charge from BookLook Bloggers book review program of Zonderkidz (a registered trademark of Zondervan) in exchange for an honest review. I was not required to write a positive review. All thoughts below are my own. Also, this blog post includes affiliate links to purchase the book and I will receive a commission based on sales generated. This sweet, expressive picture book showcases tender moments between a parent bunny and her little one. With adorable illustrations and a soft, rhythmic tone, this is the perfect book for an Easter basket, a thoughtful gift or an afternoon snuggle! ★★★★★ | This beautifully illustrated picture book is a perfect addition for any young child’s library. Sean Julian creatively displays these adorable bunnies with soft edges, bright colors and eye catching backdrops. The sweet animals romp and play throughout the pages with other cute animals in the background. At the turn of each page, there is a sweet, rhythmic lyric for parents to read to their children that embraces the bond between a parent and child. I Love You, Funny Bunny expresses the beauty of a strong love and all the tiny, wonderful moments we often take for granted as parents. As a parent myself, reading this book to my 9 month old daughter, I found this book to be sweet and tender. I love the way she scrunches her nose and calls my name and forget to tell her that as often as I should. I adored that I Love You, Funny Bunny encouraged unconditional love, while building self esteem in a child and thus strengthening a parent/child bond. I believe this book is well suited for young children under the age of 8. Because the rhymes are short and sweet, and each page is a change of colors and setting, this picture book will capture even the shortest of young attention spans. The cover is a paper jacket over a hard bound, illustrated cover and the pages inside are thick sturdy paper. The book would make an excellent Easter basket addition, a thoughtful gift for a new parent or young child or as an addition to your own child’s collection. Lastly, pick up your own copy of I Love You, Funny Bunny or borrow it from your local library. A superb combination of historical and contemporary fiction with powerful characters, a brilliant storyline, riveting suspense and a captivating dash of romance! Author Jaime Jo Wright completely outdoes herself with this third time slip novel that is sure to capture readers imaginations and hearts in an edge-of-your-seat page turner! Both the depth of this story and the compelling plot are truly remarkable, showcasing the creative way in which Wright delivers the narrative. Left at an orphanage as a child, Thea Reed vowed to find her mother someday. Now grown, her search takes her to turn-of-the-century Pleasant Valley, Wisconsin. When the clues she finds lead her to a mental asylum, Thea uses her experience as a postmortem photographer to gain access and assist groundskeeper Simeon Coyle in photographing the patients and uncovering the secrets within. However, she never expected her personal quest would reawaken the legend of Misty Wayfair, a murdered woman who allegedly haunts the area and whose appearance portends death. A century later, Heidi Lane receives a troubling letter from her mother--who is battling dementia--compelling her to travel to Pleasant Valley for answers to her own questions of identity. When she catches sight of a ghostly woman haunting the asylum ruins in the woods, the long-standing story of Misty Wayfair returns--and with it, Heidi's fear for her own life. ★★★★★ | Since reading the Reckoning at Gossamer Pond, I found myself eagerly listening to the House on Foster Hill by way of my Scribd account, highlighting the fact that I truly loved Jaime Jo Wright’s creative storytelling and suspenseful, time slip narratives. But only time could reveal that my absolute favorite of Wright’s novels is her newest release, The Curse of Misty Wayfair. As I delved into this new story, I was immediately immersed in two stories… That of Thea Reed, a young woman who’s searching for her roots so to speak at the beginning of the twentieth century, and that of Heidi Lane, a present day woman who’s returned home at the mysterious bidding of a letter penned by her dementia ridden mother. Both stories take readers captive from the very beginning… Wright has a way of creating magnetic, multi dimensional characters that are relatable and likable. While I loved Thea and Simeon’s story, it was the dynamic relationship between Heidi and Rhett that I found captivating, amusing and enjoyable. Their strength, and stubbornness, made for some great interactions that left me smiling. Not to mention, the intricate way these two stories wove together in a fascinating tale of suspense, mystery and intrigue was phenomenal! Overall, this was an excellent read. It’s clear that Wright is a master of words and very studious of people and their unique makeup. She portrays her characters and their thoughts in a way so relatable, readers can easily identify with them. I love how each of her books portrays a character with special needs and the unique qualities those characters bring to the story, as well as the concept that everyone is made in God’s image with love and for a specific purpose. The faith elements woven throughout this novel are rich, deep and inspirational. The clear impact a personal relationship with the Lord is evident and following the characters on their journey to uncover God’s truths is enlightening and relevant. Along with Wright’s other two novels, I highly recommend The Curse of Misty Wayfair to both historical fiction lovers and contemporary fiction readers. It is also a great read for mature young adults and college age readers. Please, don’t miss out on this gripping novel, it won’t disappoint! Jaime Jo Wright is the Christy Award-Winning author of The House on Foster Hill. She's also the Publishers Weekly and ECPA bestselling author of two novellas. Jaime works as a human resources director in Wisconsin, where she lives with her husband and two children. To learn more, visit www.jaimewrightbooks.com. You can also follow her on Facebook, Twitter or Pinterest. Lastly, pick up your own copy of The Curse of Misty Wayfair or borrow it from your local library. Then, I'd love to hear YOUR thoughts on the book in the comments below! This sweet novel opens the door to life in the heart of Appalachia during the early twentieth century. With endearing characters and a storyline so heartwarming, it’s a must-love story from start to finish! Laurel McAdams is well acquainted with trouble, but her dreams keep her hopeful that life can improve on her mountain in the Blue Ridge. Still, trouble does come in the form of an outsider. Having failed his Bristish father again, Jonathan Taylor joins his uncle’s missionary endeavors as a teacher in a two-room schoolhouse. Laurel feels compelled to protect the tenderhearted teacher from the harsh realities of Appalachian life, even while his stories of life outside the mountains pull at Laurel’s imagination. Faced with parents angry over his teaching methods, Laurel’s father’s drunken rages, and bad news from England, will Jonathan leave and never return, or will he stay and let love bloom? ★★★★ || With a tender love story reminiscent of Catherine Marshall’s Christy, Pepper Basham shares a delightful tale of a young, British man who comes to the heart of the Appalachian mountains in 1918 at the behest of his uncle to teach at a mission school. There he meets Laurel, a young woman who’s colorful and upbeat outlook on her life in the mountains when it’s at its best, or its hardest, has him falling for the mountains, and her. Having lived in the Appalachian mountains myself, I can attest to the tugging the beautiful mountain scenery and countryside can place on one’s heart. I found this sweet novel to be both familiar and endearing. Author Pepper Basham weaves in colorful mountain phrases, wit, humor and country charm while depicting what I believe to be an accurate look at life in the mountains around the early twentieth century. The characters are likable, while the story line moves along with both the highs and lows of life in a remote area. There are strong elements of faith woven throughout the story and a beautiful underlying message of God’s never-ending love for His children and the acceptance He gives regardless of our shortcomings. In my opinion, this historical fiction novel is the perfect cozy, light read for perhaps a winter afternoon under a blanket with a cup of hot cocoa.. My Heart Belongs in the Blue Ridge: Laurel’s Dream is a wholesome read for teenagers and will charm adult readers as well. Pepper Basham is an award-winning author who writes romance peppered with grace and humor. She lives in North Carolina with her family. You can learn more about Pepper from her website, www.pepperdbasham.com, or by following her on Facebook, Twitter, Instagram or Pinterest. Lastly, pick up your own copy of My Heart Belongs in the Blue Ridge: Laurel’s Dream or borrow it from your local library. You can find more of the My Heart Belongs books on Amazon. Then, I'd love to hear YOUR thoughts on the book in the comments below! *I received a complimentary copy of this book from BookLook Bloggers book review program of Thomas Nelson (a registered trademark of HarperCollins Christian Publishing, Inc.) in exchange for an honest review. All thoughts below are my own. Also, this blog post includes affiliate links to purchase the book and I will receive a commission based on sales generated. Beautiful, spiritual and an excellent reminder of the true meaning of Christmas. This well planned book is sure to be a family favorite this Christmas season! ★★★★★ | This beautifully illustrated children’s version of the Christmas story details the prophecies and events leading up to Jesus birth and after. It is an excellent resource for families to read together at the Christmas season and use to discuss the true meaning of the holiday season. Not only does this adorable book have scripture laden throughout it in the form of easy-to-comprehend little blurbs, but it is spiritually sound as author Sarah Young narrates the Christmas story. Near the end of the book, there’s a message to children “from Jesus” and it is heartwarming and truthful. Since my daughter is just under one, this book was a highlight for her with its bursts of colorful illustrations that she loved. It is a bit mature for really young children in terms of wording, so it’s best read with a parent who can encourage insightful study and answer questions a child might have. The book is paper pages so in that respect it’s better suited for older children, or toddlers who are gentle with books. (UPDATE: After posting this review, I learned this book is available as a board book!) Because the content is rich in spirituality, this book is appropriate for multiple ages with older children benefiting the most, however, it is one I intend to read to my little girl each Christmas. In our home, we don’t shy from the reality of what our Lord went through in his young days being sought out by King Herod or taken to the cross to die for our sins. We want our children to understand these things at an early age and this particular book is a great gateway in explaining how and why our Lord came to earth as well as the reasons He loves us as His children. Lastly, pick up your own copy of Jesus Calling: The Story of Christmas or borrow it from your local library. ★★★★★ | This powerful, insightful glimpse into Elisabeth Elliot’s first year as a missionary in Ecuador is not only heartwarming, but spiritually enlightening as well. Readers will follow along as Elisabeth shares her journey to the jungle, her experiences, her innermost thoughts and feelings and the impressions God laid on her heart in the form of multiple lessons. In high school, I read about the missionary lives of Elisabeth Elliot and her husband Jim, an evangelical Christian who was one of five missionaries killed by the Huaorani Indians in 1956. While I haven’t yet read Elisabeth’s bestselling book, Through Gates of Splendor, I was familiar with their lives and story. I thoroughly enjoyed her story and found it to be relatable, deeply personal and very touching. 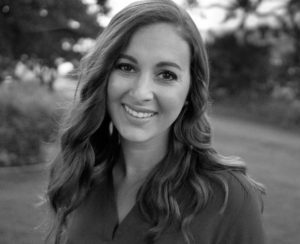 Elisabeth did not shy away from sharing the harsh realities she faced or the thoughts she struggled with, but she shares in a tender and peaceful way. As she questioned what she felt was God’s will in her life, true human nature is displayed and I found myself identifying with those thoughts and feelings through hardships in my own life. The way Elisabeth presents the lessons she learned and the truths God revealed to her was concise and soul filling. Indeed, God always takes care of His children, even if we don’t understand the “how” or “why” at the present time. This book is well organized, with each chapter reviewing different aspects of Elisabeth’s first year - sharing about the native people, customs, daily chores and necessities, meals, flora and fauna, animals and creatures she experienced, her work in linguistics and more. I believe Made for the Journey is an excellent educational tool for homeschool teenagers, an inspiring read for any teen or adult and could be used as a discussion guide amongst Sunday school or Bible study classes. Elisabeth Elliot (1926-2015) was one of the most perceptive and popular Christian writers of the last century. The author of more than 20 books, including Passion and Purity and The Journals of Jim Elliot, Elliot offered guidance and encouragement to millions of readers worldwide. Lastly, pick up your own copy of Made for the Journey or borrow it from your local library. Then, I'd love to hear YOUR thoughts on the book in the comments below!